PlayTech is a casino software company that was established in 1999 and now serves some of the biggest names in the online casino industry. Major online casinos such as Europa Casino and Vegas Red are powered by PlayTech, as well as many smaller casino sites and a variety of online poker sites. Casinos powered by PlayTech have access to more than 140 different casino games and can even offer their players access to live table dealers via webcam. Today PlayTech is traded on the London Stock Exchange and employs over 700 people around the world. Due to its status as a publicly traded company, PlayTech does not allow players from the US at any of its casinos. 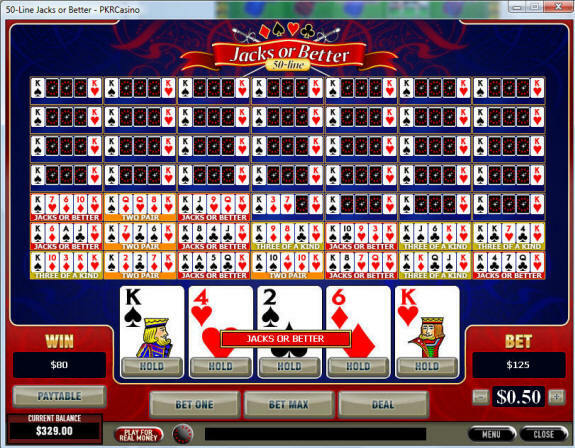 PlayTech offers seven video poker games including some rarities such as Two Ways Royal and MegaJacks. There are also the classic games like Jacks or Better and Deuces Wild. Three of the games are offered in multi hand as well as single hand play. PlayTech also offers a progressive 10-hand Jacks or Better machine and a progressive MegaJacks game. These are two of the few progressive video poker machines online. I really like how the multi-hand machines show your Win rack up in the bottom left as each hand is dealt out. It helps you keep track of how the hand is progressing, as most of us can't follow the super tiny cards that are in the middle of the screen. *The MegaJacks game is a progressive game, so we couldn't calculate the exact payout percentage for it because it changes as the jackpot rises and falls. PlayTech has many online casinos to its name and most of them are high class operations. The very best ones are listed here so make sure you check these out before any of the other, less well-known PlayTech casinos out there. Also, remember that PlayTech Casinos do not accept players from the US. If you would like a USA friendly casino, check out some of the more popular Real Time Gaming casinos.